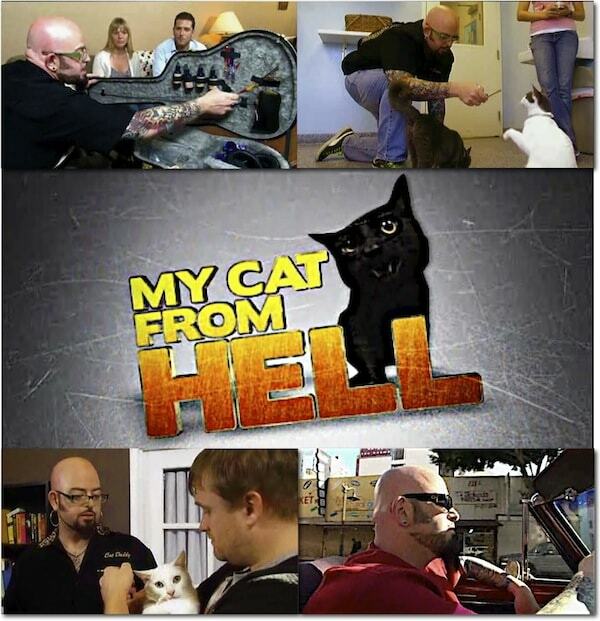 You’ve watched Cat Daddy Jackson Galaxy come to the rescue of behaviorally challenged cats and their humans for three seasons. Armed with his signature guitar case filled with cat toys, Spirit Essences and other training aides, Jackson trains the humans as much as he trains the cats, since the majority of feline behavior problems are caused by humans who don’t understand cats’ natural behaviors. This just in: Animal Planet has renewed My Cat from Hell for a fourth season, and they’re put out a casting call for the new season. If you have a cat whose behavioral challenges are driving you crazy, they want to hear your story! It hasn’t been determined which cities they’ll be filming in this season, so this casting call is open to all US locations. Tell us, in detail, about your cat’s behavioral problems and why you (or your family) are at your wits end. Looking forward to the fourth season! I know what you mean, Texas. I’m always grateful that Allegra and Ruby are such good girls after watching the cats on the show! I was wondering when the fourth season is scheduled to air? And thanks to Jackson I’m using his methods to rehabilitate a lot of stray cats to loveable cats at the Richardson Animal Shelter and give lots of useful advice based off of his methods and research for non cat people to get them a lot better. Even my twin boys love helping with animals and they’re only a little over a year. So thank you Jackson for all the diverse and fundimental teachings and can’t wait to watch the next seasons and learn more to help save more cats with my family. I’m not sure when the new season will air, Bethany, but I’ll be sure to post about it as soon as I find out! I learn something new from every episode, too. Can’t wait! Season 3 was just catabulous! Me, either, Caren. I learn so much from every single episode. LOVE this show! Jackson Galaxy is amazing! I agree, Jessica. We’re big fans! I love watching this show but am happy to report my cats will not be on it–they are PURRRfect! I always have that reaction when I watch the show, Karen: thank God my girls are so purr-fect!